BELLEVILLE – As the battle against the opioid crisis in Ontario continues, Loyalist College is offering students a medical kit that prevents overdoses. The NarCan naloxone kits are available to students living both on and off-campus. 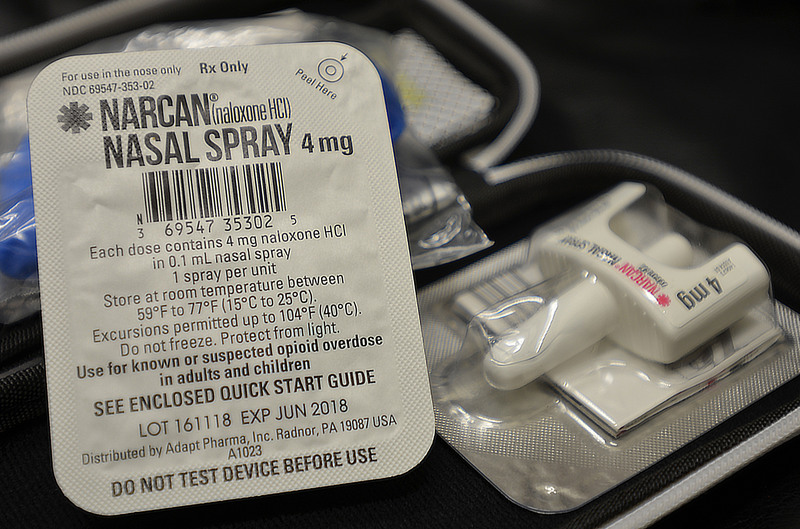 The four-milligram dose of naloxone is an easy-to-use nasal spray that can be administered as an emergency treatment in the case of a known or suspected opioid overdose. The spray temporarily stops overdoses from street drugs such as heroin, morphine, carfentanil, methadone and codeine. The kits have been available on campus since this past spring and are free to anyone who needs them, Student Health Centre nurse Lauren Deans told QNet News. Students can come to the health centre to sign up to get their own kit, Deans said. All a student has to do is ask. The opioid crisis is the biggest drug-use issue she has seen in the course of her 37-year nursing career, Deans said. According to Public Health Ontario, the illicit opioid fentanyl is being cut into street drugs. In 2015, the most recent year for which statistics are available, that practice was responsible for 730 opioid-related deaths in Ontario. If you use street drugs, “you’re taking a shake of the dice that you aren’t getting a heavy dose” of a potentially fatal drug, said Deans. Any Loyalist student can request through Deans a training session on how to use the NarCan kits and how to recognize the signs of an overdose. The introduction of the nasal-spray kit in the Quinte region came just under a year after the launch of the LifeSaver Program – an initiative of Hastings Prince Edward Public Health that aims to reduce preventable deaths from drug overdoses. Stephanie McFaul, the sexual health and harm reduction manager at the health unit, said the original kits included an injectable needle containing naloxone, a drug that temporarily stops the effects of the opioid in the brain. But the program has since transitioned to using a nasal spray, she said. Since the program began, close to 200 kits have been distributed, McFaul said. Like Deans, McFaul expressed concern about the extent of the opioid epidemic. “We continue to see overdose deaths and hospitalizations; it’s still a public-health crisis,” she said. “The crisis isn’t stopping. And there’s a need to talk about the issue and inform the public of the dangers and risks. “We need to make sure they know where they can access a kit and have it available. She hopes to see many more kits available throughout the community in the next year, she said. The NarCan nasal kits are available at many public health offices and pharmacies in the area. For more information, visit the NarCan official site. Correction: An earlier version of this story said incorrectly that when students need a naloxone kit, they can get them from various locations. In fact they sign up for a kit at the student health centre, where it will be supplied by the public health unit. 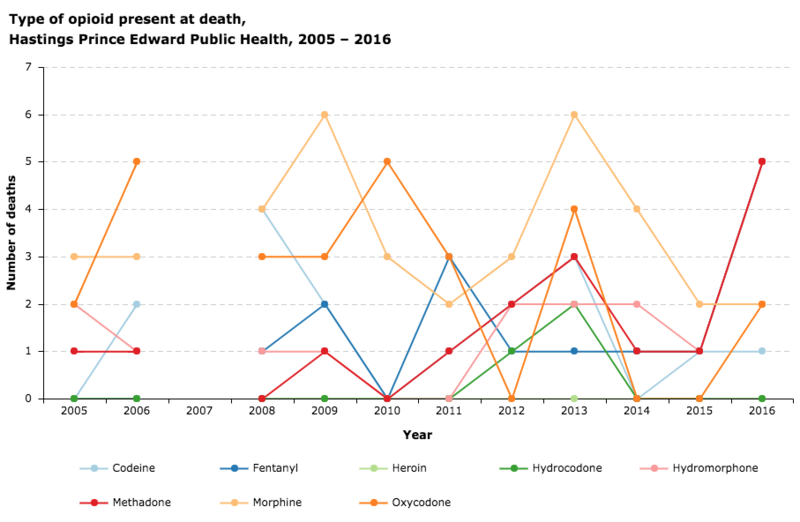 Types of opioids present at death in period 2005 to 2016 in this region. Graph courtesy of Public Health Ontario. Loyalist students start first Magic Wheelchair team outside the U.S.